There can be little argument that CHIC was disco’s greatest band; and, working in a heavily producer-dominated field, they were most definitely a band. By the time CHIC appeared in the late ’70s, disco was already slipping into the excess that eventually caused its downfall. CHIC bucked the trend by stripping disco’s sound down to its basic elements; their funky, stylish grooves had an organic sense of interplay that was missing from many of their overproduced competitors. 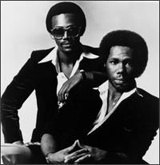 CHIC’s sound was anchored by the scratchy, James Brown-style rhythm guitar of Nile Rodgers and the indelible, widely imitated (sometimes outright stolen) bass lines of Bernard Edwards; as producers, they used keyboard and string embellishments economically, which kept the emphasis on rhythm. CHIC’s distinctive approach not only resulted in some of the finest dance singles of their time, but also helped create a template for urban funk, dance-pop, and even hip-hop in the post-disco era. Not coincidentally, Rodgers and Edwards wound up as two of the most successful producers of the ’80s. Rodgers and Edwards first met in 1970, when both were jazz-trained musicians fresh out of high school. Edwards had attended New York’s High School for the Performing Arts and was working in a Bronx post office at the time, while Rodgers’ early career also included stints in the folk group New World Rising and the Apollo Theater house orchestra. Around 1972, Rodgers and Edwards formed a jazz-rock fusion group called the Big Apple Band. This outfit moonlighted as a backup band, touring behind smooth soul vocal group New York City in the wake of their 1973 hit “I’m Doin’ Fine Now.” After New York City broke up, the Big Apple Band hit the road with Carol Douglas for a few months, and Rodgers and Edwards decided to make a go of it on their own toward the end of 1976. At first they switched their aspirations from fusion to new wave, briefly performing as Allah & the Knife Wielding Punks, but quickly settled into dance music. They enlisted onetime LaBelle drummer Tony Thompson and female vocalists Norma Jean Wright and Alfa Anderson, and changed their name to CHIC in summer 1977 so as to avoid confusion with Walter Murphy & the Big Apple Band (who’d just hit big with “A Fifth of Beethoven”). Augmented in the studio by keyboardists Raymond Jones and Rob Sabino, CHIC recorded the demo single “Dance, Dance, Dance (Yowsah, Yowsah, Yowsah)” and shopped it around to several major record companies, all of which declined it. The small Buddah label finally released it as a 12″ in late 1977, and as its club popularity exploded, Atlantic stepped in, signed the group, and re-released the single on a wider basis. “Dance, Dance, Dance” hit the Top Ten, peaking at number six, and made CHIC one of the hottest new groups in disco. CHIC scrambled to put together their self-titled first album, which spawned a minor follow-up hit, “Everybody Dance,” in early 1978. At this point, Wright left to try her hand at a solo career (with assistance from Rodgers and Edwards), and was replaced by Luci Martin. It was a good time to come onboard; “Le Freak,” the first single from sophomore album “C’est CHIC”, was an out-of-the-box smash, spending five weeks on top of the charts toward the end of 1978 and selling over four-million copies (which made it the biggest-selling single in Atlantic’s history). Follow-up “I Want Your Love” reached number seven, cementing the group’s new star status, and “C’est CHIC” became one of the rare disco albums to go platinum. The disco fad was fading rapidly by that point, however, and 1980’s “Real People” failed to go gold despite another solid performance by the band. Changing tastes put an end to CHIC’s heyday, as Rodgers and Edwards’ outside production work soon grew far more lucrative, even despite aborted projects with Aretha Franklin and Johnny Mathis. Several more CHIC LPs followed in the early ’80s, with diminishing creative and commercial returns, and Rodgers and Edwards disbanded the group after completing the lackluster “Believer” in 1983. Later that year, both recorded solo LPs that sank without a trace. Hungry for acceptance and respect in the rock mainstream (especially after accusations that they had ripped off Queen instead of the other way around), both Rodgers and Edwards sought out high-profile production and session work over the rest of the decade. Rodgers produced blockbuster albums like David Bowie’s “Let’s Dance”, Madonna’s “Like a Virgin”, and Mick Jagger’s “She’s the Boss”. Edwards wasn’t as prolific as a producer, but did join the one-off supergroup the Power Station along with Tony Thompson as well as Robert Palmer and members of avowed CHIC fans Duran Duran; he later produced Palmer’s commercial breakthrough, “Riptide”. Edwards also worked with Rod Stewart (“Out of Order”), Jody Watley, and Tina Turner, while Rodgers’ other credits include the Thompson Twins, the Vaughan Brothers, INXS, and the B-52’s’ comeback “Cosmic Thing”. After a 1989 birthday party where Rodgers, Edwards, Paul Shaffer, and Anton Fig played old Chic hits to rapturous response, Rodgers and Edwards re-formed CHIC in 1992 with new vocalists Sylver Logan Sharp and Jenn Thomas, and an assortment of session drummers in Thompson’s place; they toured and released a new album, CHIC-ism. In 1996, Rodgers was honored as the Top Producer in the World in Billboard Magazine, and was named a JT Super Producer. That year, he performed with Bernard Edwards, Sister Sledge, Steve Winwood, Simon Le Bon, and Slash in a series of commemorative concerts in Japan, which provided a career retrospective. Unfortunately, his longtime musical partner Edwards died of pneumonia at age 43 during the trip on April 18, 1996. His final performance was recorded and released as Live at the Budokan. Chic continued to tour with new musicians. In addition to refining a relatively minimalist take on the disco sound, Chic helped to inspire other artists to forge their own sound. For example, The Sugarhill Gang used “Good Times” as the basis for its hit “Rapper’s Delight”, which helped launch the hip hop recorded music format as we know today. Later that year, Vaughn Mason and Crew sampled “Good Times” on its song “Bounce, Rock, Skate, Roll.” “Good Times” was also used by Grandmaster Flash and the Furious Five on its hit “..On the Wheels of Steel,” which was used in the end sequence of the first hip-hop movie, Wild Style, from 1982. Blondie’s 1980 US number-one hit “Rapture” was not only influenced by “Good Times” but was a direct tribute to Chic, and lead singer Deborah Harry’s 1981 debut solo album Koo Koo was produced by Edwards and Rodgers. On September 19, 2005, the group was honored at the Dance Music Hall of Fame ceremony in New York when they were inducted in three categories: 1) Artist Inductees, 2) Record Inductees for “Good Times,” and 3) Producers Inductees, Nile Rodgers and Bernard Edwards. CHIC has been nominated for inclusion in the Rock & Roll Hall of Fame five times — 2003, 2006, 2007, 2008 and 2009. 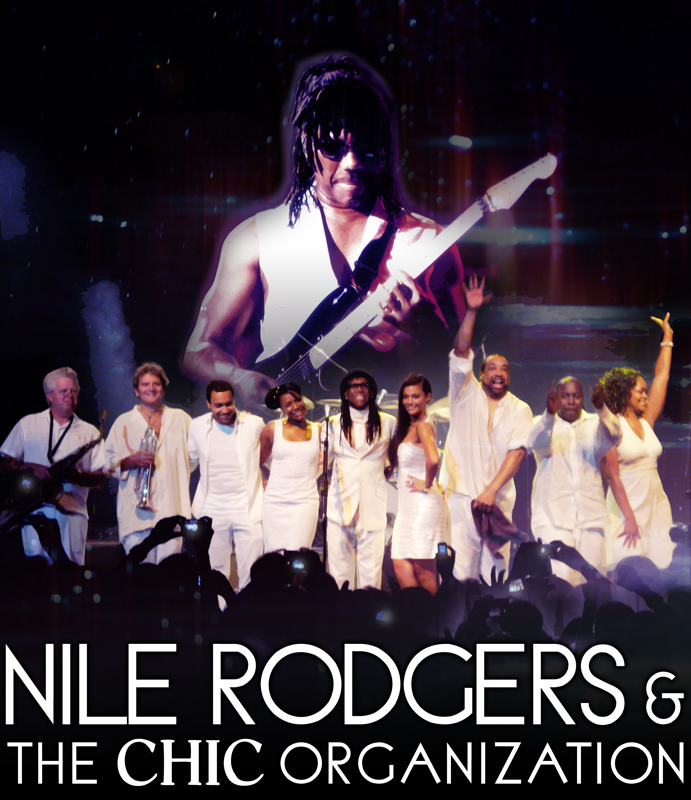 CHIC, now billed as Nile Rodgers & CHIC, continue to perform to sold-out venues worldwide. They have played several sold out shows in Ireland.